Thünk you very much. Welcome to the Thünk initiative. Thünk is the new artförm. Thünk rhymes with Fünk. Thünk is the past tense of Think, and the future tense of Thänk. Thünk is an ever expanding moment, a 360 degree advance in all directions at the same time. 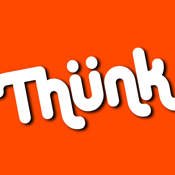 I Think, therefore I Thünk. Thünk has no boundaries, much like the Universe, and also, certain really annoying people we all know. Thünk you very much. Welcome to the Thünk initiative. • Exclusive Thünk Initiative Dance Remix!